Mission The Infant Learning Centre is the place for new readers. The students progress from the ABCs, once they have passed the Post Test, to the Infants. Here they grow in confidence with their reading and continue to build skills and develop wisdom. They have new reading and comprehension skills to learn in Science and Social Studies PACEs. In the Infant Learning Centre the students work on individualised curriculum during the morning. These new readers read to their Supervisor daily and must read school Reading Books at home with their parents also. They have Maths Builder, Readmaster and Word Builder to strengthen Maths, Comprehension, Vocabulary and Spelling. These skills are augmented daily by ACE computer software designed to enhance the ACE programme. As they progress to the Infant department they proceed in their PACEs. They are now readers and enjoy their 5 different core subjects – Maths, English, Social Studies, Science and Word Building. Soon they will add in Literature, and then progress to Animal Science and Bible Reading for the students finding their work easy. The Infants work at their own PACE and progress individually as they continue in the school. The Infants are developing in responsibility, learning to set their own goals and score their own work with the assistance of the staff. They are also learning to take care of their property, to dress themselves and to clear up after themselves. They learn about their responsibility to other people and the world around them. They learn to have a good understanding of who they are, where they come from and to develop self-control and self-esteem. The Preschool and ABCs join the Infants for break times and for afternoon lessons. The afternoon lessons bring in the more practical side of the curriculum. There are a wide variety of interesting activities, ranging from learning through play and messy footprint painting to Information Technology, practical Science and Geography. They have fun with art and music and develop their brains with subjects like History and Drama. 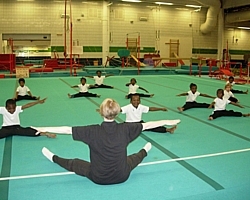 They attend the Manchester Institute of Gymnastics where they gain badges in gymnastics.